Slim Sip is weight loss drink marketed by the British company High Street TV Group Ltd and marketed under the New Image Health brand name. It is primarily designed to function as an appetite suppressant, but its use is also intended to help manage cholesterol levels. Most appetite suppressants are produced in capsule form, but a drink like Slim Sip may prove to be a preferable option for anyone who has difficulty swallowing, or just does not like capsules. 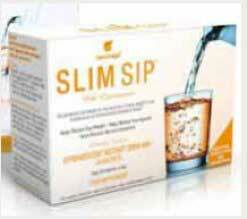 Like all appetite suppressants, Slim Sip has been formulated to assist weight loss by dulling the appetite to help prevent the user from consuming too many calories. If the formulation works in the intended manner its use should help prevent further weight gains and, if the amount of calories consumed each day falls too low, the body will be forced to initiate the fat burning process to get the extra calories it needs. That’s the theory, but in practice most weight loss formulations can only produce credible results when used in conjunction with a calorie controlled diet. Slim Sip is no exception. Glucomannan is the main ingredient. Everything else is just there to help provide some colour and flavour, put a little fizz into the drink, and prevent the powder from caking. Glucomannan is a fibrous substance obtained from the roots of a perennial plant called konjac and several studies have shown use of the ingredient can produce credible weight loss results. Glucomannan’s power as a weight loss inducer stems from its ability to absorb large quantities of water, so glucomannan supplements are always taken with plenty of water to ensure adequate fibre expansion. Once expanded the fibres leave little room in the stomach for food so, when taken prior to a meal, the use of glucomannan supplements can be very effective. For best results Slim Sip should be taken three times each day (30 minutes before eating a main meal) and be used alongside a calorie restricted diet. One sachet should be mixed with a glass of water and the consumed. One to two further glasses of water should then be consumed to help ensure maximum benefits. Customer feedback shows a mixed response to the product. Many consumers complain they did not like the taste of the drink, others say the drink made them feel sick, but around 50% of Slim Sip users say the product worked for them. The taste appears to be a problem for many users; apart from that side effects are unlikely to be an issue, but pregnant and nursing mothers should not use any form of dietary supplement unless its use has been approved by their doctor. The same advice is offered to anyone who has existing healthy issues. Slim Sip is a readily available product that can be purchased from many online stores and can also be found on the shelves of many chemist shops, including Boots and Lloyds. Expect to pay £17 to £20, but don’t expect a refund if the product doesn’t work because there is no money back guarantee. 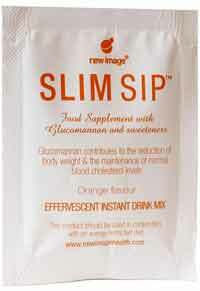 Although Slim Sip shows some promise it is not one of our recommended slimming products. We have compiled a list of what we consider to the best choice as far as a Uk consumer is concerned.